This month’s newsletter offers an early taste of the content Mercaris plans to offer to the organic and non-GMO agricultural sectors. The article below provides analysis and discussion of the 2011 Certified Organic Production Survey recently published by the National Agricultural Statistics Service (NASS), and compares the latest results to data gathered in 2008. Another USDA agency, the Economic Research Service (ERS), will soon release organic acreage data from the 2010 and 2011 crop years that will enhance what we learned from the NASS survey. Mercaris expects to provide similar analysis on the ERS data when it becomes available. And stay tuned as we begin gathering our own original data and providing analysis of it in the future. Things are really picking up here at Mercaris! We’ve visited many of you from North Dakota, Wisconsin, Illinois, and Minnesota and we’re thrilled with your input. After all we’re here to serve you, the organic and non-GMO community. A Closer Look at NASS Organic Acreage and Production: What can the data tell us? Those who have sought out information on organic acreage and production have most likely encountered data published by USDA’s National Agricultural Statistics Service (NASS). NASS produces annual acreage and production statistics on conventional agriculture and periodic data on the organic sector. Due to resource constraints, NASS has only released two organic production surveys over the past five years. Still, it offers the most comprehensive snapshot available of organic acreage, production, and sales. The latest organic statistics were released by NASS in October 2012. 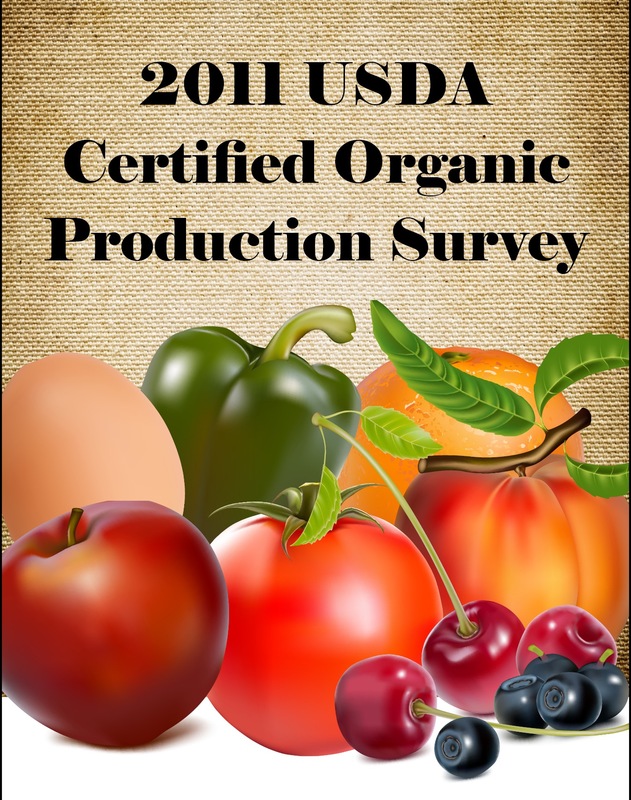 The 2011 Certified Organic Production Survey captures data from the 2011 growing season and is an update to the 2008 Organic Production Survey. Because of differing data sets and methods between the 2008 and 2011 surveys, simply comparing total acreages side by side can lead to misleading results. For example, the 2008 survey collected data for crops that were not included in the 2011 survey, such as floriculture, Christmas trees, and mushrooms. Thus, our analysis attempts to control for inconsistencies between the two datasets and draws inferences based on those differences. Acreage has declined (though perhaps not as much as initial comparisons might suggest), while production and sales have increased. Organic wheat has experienced the largest acreage decline among field crops. Products derived from organic livestock, i.e., eggs and dairy, outcompeted organic meat. The sector needs more frequent updates to the Organic Production Survey. According to the latest survey, certified organic land in the U.S., including estimated total crop, pasture, and rangeland, totaled 3.65 million acres in 2011. Harvested acreage on certified organic land was 1.5 million acres, while organic pasture and rangeland totaled 1.6 million acres. A direct comparison of the 2008 and 2011 surveys implies a decline in both the number of certified organic farms and the number of acres. Total farms declined by 16 percent, while total organic land acreage declined by 9 percent. The proportionally larger decrease in the number of certified organic farms suggests consolidation into larger farms within the sector. At first glance, harvested acreage on certified organic land in 2011 appears to have declined by as much as 9 percent from 2008, but when we account for differences between the two data sets (including a rough imputation of missing acreage for some crops in one or both surveys), we estimate that total harvested cropland acreage decreased by closer to 4 percent. Although certified organic acreage likely declined in 2011, the value of organic sales increased at a healthy rate. Total organic farm sales reached $3.5 billion in 2011, up 18 percent from 2008. The change in sales value is more than double the rate of inflation over the same period, and may indicate growing consumer demand for organic products. Unfortunately, certified organic acreage is not keeping up with this demand. Field crops comprise the largest share of U.S. organic cropland, and the decline in harvested acreage between 2008 and 2011 stems primarily from losses in field crop acreage. We estimate the 2011 decline in total field crop acreage at around 50,000 acres, or close to 4 percent, with the bulk of the acreage loss confined to wheat. It is unclear from the data how much durum wheat acreage was lost between the two surveys, but combined losses of organic spring and organic winter wheat acreage total 41,000 acres. Nonetheless, winter wheat remains the second largest organic crop by acreage after hay. Though harvested acreage increased slightly for hay and corn, the general direction of organic field crop acreage appears to be one of decline. Factors behind this stagnant or downward trend likely involve price. Prices for organic grains published by the Agricultural Marketing Service weakened in 2009 and 2010, which would have reduced producer compensation relative to the greater effort and risk involved with organic production. In addition, prices for conventional field crops began to strengthen in 2010, which likely reduced the attractiveness of organic production compared to conventional methods. The loss of organic acreage was offset by small gains in production. Production of organic feed grains between 2008 and 2011 was generally positive due to yield gains over the period. Combined production of spring and winter wheat increased 10 percent due mainly to a 9 bushel per acre yield gain for winter wheat in 2011. Hay production increased 8 percent from 2008, while soybean production increased 12 percent. Production of corn for grain fell 9 percent due to both shrinking acreage and yield, while oat and barley production also saw decreases. Inventories of organic livestock reveal mixed growth between 2008 and 2011, but they tell a story about where organic livestock production may be headed, at least in the short term. Livestock products such as eggs and dairy appear to have momentum, while organic meat production (with the exception of turkey) appears to be shrinking. The trend is clearest in chicken inventories, where a 34 percent inventory loss for broiler chickens was offset by a 51 percent increase in layers. Overall chicken inventories increased 1 percent from 2008 due to the gains for layer chickens. Though NASS did not collect data on organic meat sales, total sales of broiler chickens fell 35 percent between 2008 and 2011, while sales value of broilers fell by an even larger 70 percent. By contrast, the sales volume of organic eggs rose 67 percent between 2008 and 2011, while the sales value increased by 78 percent. Peak dairy cow inventories decreased 3 percent from 2008, but the larger decrease was for beef cattle inventories, which fell 21 percent. Nonetheless, the declines in these two categories were offset by inventory growth for other cattle and calves, so overall organic cattle inventories rose 4 percent from 2008. Though dairy cow inventories declined 3 percent between 2008 and 2011, volume of organic milk sold increased by 5 percent over the period, suggesting greater yield per cow. Sales value of organic milk increased by a lesser 2 percent rate, likely due to the gain in milk yields. By contrast, sales volume of beef cows dropped 7 percent, while the value of beef cattle sold increased 39 percent, consistent with reduced supply. Inventories of other organic quadrupeds such as hogs and pigs, sheep and lambs, and goats and kids all declined over the period, as did sales volume for these categories. However, sales value increased by 19 percent for hogs and pigs and 57 percent for goats and kids. Finally, organic turkey inventories soared 118 percent from 2008, while volume sales of organic turkeys more than doubled and sales value nearly tripled. With healthy U.S. consumer demand for organics, the question of whether and how organic production will meet this demand is important. One possible response is to increase imports of organic crops, though buyers likely prefer domestically-sourced inputs. Another is to offer higher prices to domestic producers and/or better communicate price information to producers, as lack of transparent prices may unnecessarily discourage producers from converting to or staying with organic production methods. Our intent at Mercaris is to facilitate understanding of organic and non-GMO market conditions throughout the sector via original price data collection and economic analysis of existing data. In addition to regular, regionally-relevant price information, the sector needs more acreage and production data. The next organic production survey conducted by NASS is tentatively scheduled to cover the 2015 crop year and be released in 2016 (assuming funding is available). This four-year gap between surveys would be unthinkable to participants in conventional agriculture. USDA’s Economic Research Service (ERS) may fill in some of the details. ERS also publishes data on organic acreage and livestock inventories on a periodic basis, but for multiple crop years. ERS does not estimate production or sales, and its methodology differs from NASS in that it collects acreage and inventory data via a census of organic certifiers rather than a survey of producers. Its approach may result in more comprehensive acreage data due to reduced likelihood of non-response and the presence of data for intervening years. ERS expects to release organic acreage data on the 2010 and 2011 crop years sometime in the first quarter of 2013 (2009 data will not be available due to budget constraints). We expect to fully analyze this data when it becomes available and look forward to sharing with you any new insights it provides. Comparison of sales when adjusted for crops not included in the 2011 survey. Mercaris is looking for a Manager of Market Operations with an understanding of organic and non-GMO markets. Interested in joining a dynamic, growing company? Click here for more information. Get an early look at our new organic & non-GMO pricing tool, and input into developing it! If you’re a buyer or seller of organic or non-GMO grains, contact us for more information.